Newsflash... Enterprises reduce costs by outsourcing, but struggle to achieve little else of value. Well, on the surface, this would still appear to be largely true, but when you rummage even deeper under the covers, you'll soon discover it's more the legacy IT outsourcing deals which are still all about low-cost bums on seats, while we are actually seeing a few chinks of light with BPO that could resemble what we've been searching for since we started this damn blog... value beyond cost (gasp!). So what do we read into this data? Outsourcing achieves its table-stakes goals and makes some progress providing value. On the strong positives, enterprises are achieving success when it comes to meeting their cost targets, globalizing their operations and even standardizing processes. In fact, barely one-in-seven can claim to be actually dissatisfied with their meeting these goals to-date. Also quite encouraging, is the fact that the majority of enterprises are achieving positive outcomes with higher-value areas, namely accessing capable talent and transforming processes, even though these are largely modest results for most enterprises. Considering most buyers venture into outsourcing seeking these initial "table-stakes" goals of cost-reduction, global scalability and process standardization, you have to give a healthy thumbs up to those providers and buyers for achieving these initial objectives. However, can today's ambitious enterprises really turn around and claim they are happy with basic, operational success in today's economy, or do they want to seek to move beyond ordinary? Outsourcing is falling short when it comes to innovation and analytical value. With all the puff and bluster about "Big Data" and analytics, and the pivotal need for today's enterprises to get better at managing, understanding, an interpreting their internal and external data, it's vital that outsourcing engagements support this capability for buyers. I would go as far as declaring a provider's capability to create collaborative analytical partnerships with clients is critical to the future success and growth of outsourcing. If we only focus on these "table-stakes", we will eventually arrive at the dreaded lowest common-denominator of outsourcing... where the provider with the cheapest labor and a basic ability to deliver average performance, wins. We can see here that BPO engagements are clearly outperforming ITO engagements, not only in many key tactical areas which clients care about (i.e. cost and process standardization), but also across strategic measures, namely proving greater analytical capability and innovation. 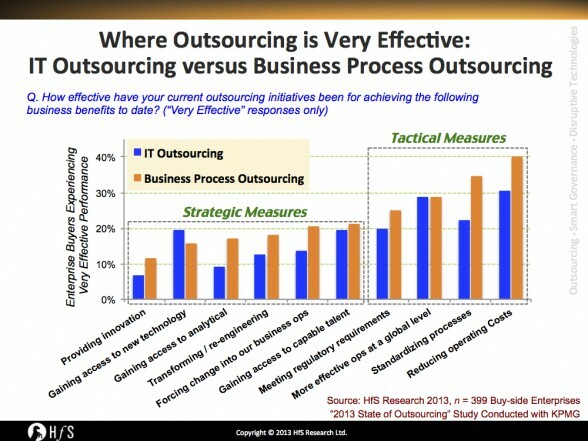 So what does this mean to the future direction of outsourcing? Clients pay for - and receive - "cheap and cheerful" ITO. When you consider that most major enterprises began outsourcing administrative IT in the 90's (and some even earlier), you have to draw the line that if these are the results of two decades of engagements, it probably isn't going to get much better. However, this is probably because most ITO buyers are pretty much getting what they have set out to achieve: "utility" IT services in areas such an help desk ticketing, infrastructure support, application maintenance and development. Clients wanted cheap and cheerful.... they got cheap and cheerful. And there are many providers, today specializing in the cheap and cheerful, who are really damned good at it. Some of them even openly discuss with analysts and advisors that their main strategy is to target HP (EDS) and IBM renewals and undercut them by 30%. ITO has founds its rhythm - low-end work is outsourced, high-end is retained. Many CIOs and IT governance leads we talk to like having the grunt work outsourced so they can focus on the higher-value work inhouse. As we once revealed here, two-thirds of ERP development work is still run onshore. Ambitious CIOs these days like to focus their time on ecommerce, mobility, "Big Data" and Cloud strategies, and will engage IT consultants with projects when they need some high-end help, but most aren't expecting their outsourcer to do that kind of work for them. India created an amazing factory for taking on the specific routine work than can support large enterprise IT operations - but that is what it largely is - routine work than can be conducted efficiently at lower price-points. Managed business services, enabled by IT, are where the future value lies with outsourcing. We - at HfS - passionately believe the only way for these providers to move up the value-chain with clients is to create business services that can meet defined business outcomes. Simply put, IT provides a supporting utility to help achieve these business outcomes that clients want to buy, which would ideally be accessible in the cloud where business users can access their services wherever they want. The focus then shifts from providing widgets, to the actual provision of value, where providers start working with their clients to achieve business results, as opposed to creating simply a low-cost environment. ITO has become a supporting utility, with the real transformation happening at the business end. For example, when you buy a new car, how much time do you spend deliberating what grade of fuel to put in it? Like ITO, BPO has it's "bread and butter" needs: processing invoices, paychecks, insurance claims, ICD-10 conversions, and so on. There's a plethora of providers today which can perform said tasks on many different scales, across many geographies and industries, and can flex the pricing if they really want the business. However, unlike ITO, there's not a whole lot of value with outsourcing business operations if you're simply getting the same work done for less. ITO is already standardized, to some extent: you need 10 ABAP coders, you pay for 10 ABAP coders. With BPO, buyers' current processes are rarely standardized and solutions not nearly as easy to industrialize. Clients often need to undergo one helluva "transformation", simply to transition the stuff to a provider in the first place. Moreover, with BPO, we are dealing with business functions that are critically dependent on analytics to perform their tasks, whether they be marketing, customer service, finance, procurement, workforce management, and so on. As McKinsey recently revealed, it's this creation of analytical environments which is becoming (or will soon become) the overwhelming onus for so many enterprises, with its assumption that by 2020, we'll have a surplus of 300,000 office workers and an annual deficit of 200,000 data scientists in the US alone. When you consider that most of these "enterprise BPO" engagements have barely been around for a decade, the results are quite encouraging - 90% of buyers are meeting their transactional goals, and a good proportion are already getting some value from key areas such as accessing talent and improving analytical capability. Yes, there is a long way to go, but at least BPO is moving in the right direction. It's because clients need much more help with their business operations than simply bums on seats at cheaper prices... they are far more dependent on their provider to help create an environment for themselves to become more analytical, more process-savvy and more focused on actual results, than mere inputs. Welcome to the new phase of outsourcing, which is about partnerships what are not only cheap and cheerful, but also collaborative. Its worth noting that the reason why ITO is in a bit of a malaise is that there is a gap in technical development between buyers and provider furthered by a bit of buy side inefficiency in those legacy applications (or rather arcane approach to engineering application using failed methods). Its not about programming if the design and engineering methods are marginal at best. Some IT operators aren't just looking for cheap labor they are also looking for bandwidth. In doing so its a bit of a double edged sword in that more people means more management and even if cost is low one needs to keep herding cats. Insightful information on ITO and BPO. We see this in our businesses day in and out. Both with B2C and B2B partnerships. The only mantra for clients today is "give me more insights into my business"...meaning analytics. The flip side is while executives make such requests, access to data to help partners give insights is another Herculean task, but not impossible. It is just a matter of time and push from both sides, executives who make these requests and a constant bombarding from partners shoeing value we bring to the table. Great insight and confirms my experience over the the last 20 years in that IT is a value enabler rather than a value creator. Increasing efficiency, reducing cost, improving quality are all good goals in themselves and improve the effectiveness of the IT function. Creating and delivering value requires that new capabilities be provided AND exploited by the business to increase revenue (more customers, more sales, more wallet share) or decrease costs (fewer bums on seats). Business services capture this by combining the ITO outcomes of lower cost with new capabilities and committed BPO outcomes - value delivered. Early days for 'Business Services' but promises to be a step change in how business can capture greater value and competitive advantage through outsourcing. The problem with looking to third party service providers to enable "innovation" is that most execs have little idea of what innovation is until they see a new competitor that has enabled it. Organizations can't source something they can't agree upon, define and measure. And even if they can do this, then they have to get it by the lawyers and negotiated into the final contract, etc. etc. Enabling innovation via sourcing also involves ceding more control to the provider to creatively pursue it, something many user execs are loath to do, often with good reason. A great article on where outsourcing succeeds / fails. Excellent write up. Fully agree with the collaborative approach of outsourcing. Earlier days, we were working in a customer-vendor engagement model that was collaborative for a successfull high volume low end outsourcing work where the outsourcing partner was expected to deliver a scoped item (defined by customer only) in a fixed cost. Things are changing now and the definition of collaborative working moves up the value chain where in customer expects outsourcing partner to come and provide valuable inputs on defiing ways, business cases to meet the customer's business objectives and provide insight on how business goals can be achieved using outsourcing as an enabler. Isn't the onus on the buyer? There is a big difference between paying for a gardener and investing in a landscape designer. Buyers who think that they will get landscape designing for 'free' at the price of a gardener are always going to be disappointed. Many organisations are happy with a gardener as this meets their objectives. Others have successfully pulled in the appropriate consultants and paid the associated costs for developing innovative solutions that meet their requirements. Of course, i do not excuse our industries lack of imagination and investment in building leveraged solutions that grow ahead of the market. Payroll and benefits are good examples of how it can work.